Awake. Eyes closed. Well versed hand reaches over to my "on-call" blue chair where I keep my phone at night so I always know where it is. The "birth alarm". Or as I like to call it "birth vibe". I have a theory that because I've set the ringer on my phone for births at a nice wavy, flowy, slow building ring that I will ease into alertness when the calls come in. It's not ease - it's a phone ringing in the middle of the night. The screen is always so bright...read. Ah yes, the text that every birth photographer dreads. A precipitous birth. I get dressed in my "birth clothes" - yup, I have those. Laid out always - ready for a quick transition out of pjs. Black loose pants, super comfy top, wool socks, poofy scarf thing (best things ever), bracelet, Buff. Cameras are always at the door beside my birth bag. Grab 'em. Keys. Baby. Don't forget your baby. (For 6 months last year I carried my infant son on my back at many births.) Carseat clipped. Blanket for sleepy cuddles. Wrap? Check. He's still sleeping - check. Car. Start it. Inhale to chill for second 'cause I just woke up a minute ago. Exhale. Reverse. Put car in drive. Begin the song. Yup, I have a song that I sing on the way to every birth (more on that another time). 12 minutes after the call - car parked in a snow bank of icy Ottawa goodness. Don't forget the baby - camera bag - birth bag will stay in the car for now - wrap for baby. Exhale. Quiet knock - I can hear everyone speaking quietly. I step inside. 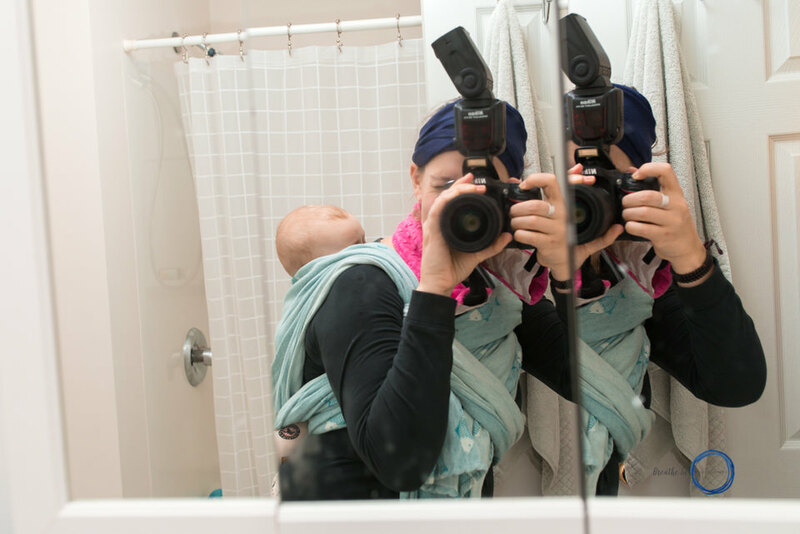 I wrap my son onto my back, take out my camera and begin. This is birth photography. What moment sticks out most about your birth? 1. Catching my daughter in the water and scooping her up to my chest. Did you have a home birth? Hospital? Birth Centre? What led you to choose that location? Home birth. I chose based on where I was most comfortable and relaxed and because my young toddler could be asleep or cared-for close by. My midwifery group and doula were also local to me, which was a bonus in unpredictable February weather. Did you move through contractions? What helped you manage your contractions / rushes? No, I preferred stillness so I could concentrate and conserve energy. I used a combination of visualization and relaxation, doula support, and a side of berating my very patient spouse. That previous pregnancy, labour, and birth experiences do not write the narrative of any subsequent chapters. Different pregnancy, different labour, different birth, different baby. When did you contact your birth photographer to come? How did you know it was time? Transition and birth were very fast, so I did not call Kim in time. Luckily my doula stepped out and called Kim while I was basking in the surprise of holding just-born baby and Kim was over ASAP, about 10 minutes after the birth and just as my older son was waking up to meet his new sister. Is there one word you would use to describe seeing your photos? What was your reaction when you saw your image gallery? Explode-a-heart! [When I saw them] I fell in love again with my husband, he was the best proud dad and I loved the way he was holding our tiny babe with confident hands of experience. Is there an image that really stands out for you? Why? I love the banana photo. I feel like it really captures "us". The love, the laughter, the reality (toddler really needed me so baby got a lot of snuggles from Dad), the too-many-things-going-on, the mess...and a random banana. What was your experience of having a birth photographer? Kim was there right after the birth and having her there was like having a trusted friend or family member. She was someone to chat with in the calm between the business. She stepped out for anything medical, but was unobtrusively present for the intimate moments getting to know each other. I could have maybe made my pictures more "picture perfect." But our pictures were taken in our sparsely furnished house after a whirlwind, stressful move. After weeks of prodromal labour, the day it was for real progressed quickly and zero consideration was given to my appearance. Post-birth, I am wearing the outfit my husband ran up and grabbed (orange nursing bra and my brother's sweatshirt - thanks, honey, for such a coordinated choice ;) )....And our pictures are still perfectly picturesque thanks to Kim's photographer eye. Happy First Birthday Baby S! Are you curious about birth photography? Please contact me to learn more about your options for 2017. Offering New Here (Fresh 48) Sessions in late June and early July 2017. Yes! Tell me more about birth photography!